We are offering feminine hygiene bin services, feminine hygiene bins services in workplace gives women a safe and hygienic way of disposing of sanitary napkins. They feel comfortable & safe. Our unique and innovative designer feminine hygiene units gives a pleasant look. Disposing of sanitary napkin is easier because of its ergonomically design. Our bin is stylish and good looking. Green Revolution- A unit of KC Enterprises is the first ever manufacturer of indigenous Feminine Sanitary Bin by using plastic injection molding technology. Our units are equipped with a smooth foot pedal for touch free operation, with a capacity of 21 liters. Our unit- surface is made of Anti-Microbial properties. 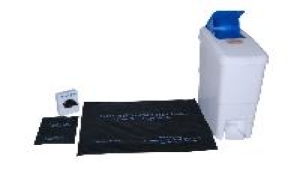 Our bin is made of virgin granules with all itâ��s parts recyclable. We carry out extensive quality checks of raw material before the production. Our unit comes with Stainless Steel flap made of AISI 304 grade. SS Flap inhibits the bacterial growth and it gives a pleasant look. We also have option of Anti-Microbial plastic flap. Our unit is uniquely designed in such a way where it can be placed in any size of cubical. The ergonomically design helps for smoother & easier operation in cubical while disposing of the sanitary napkin waste. Excellent look matches the ambience and aesthetics of your property. A wide range of Anti-Microbial consumables are also available like, Liner, Disposable bags, Disposable bag Dispensers & Enzymatic Sachet to inhibit the mal-odors and bacterial growth. Our feminine hygiene sanitary service gives the peace of mind and confidence that you are providing your visitors and employees with a safe, discreet, easy to use, and hygienic sanitary solution. Our touch free feminine sanitary units, with Integrated Anti-Microbial Technology, are the most hygienic solution to help prevent the spread of germs. Disposing of feminine sanitary waste is a sensitive issue. Washroom visitors can feel anxious about touching sanitary bin surfaces due to the potential harboring of bacteria. Providing a safe and hygienic means of sanitary disposal ensures you are providing a more pleasant experience for your visitors and employees. Reduce plumbing problems & the cost of the same. Touch- free and smoother operation to prevent nosocomial infection. Clean & Hygienic Environment in washrooms. Safe & Hygienic way to disposal of sanitary waste. Excellent & Electrifying Positive feedback from your Female Staff. Minimum harm to the Environment. We place required number of bins as per your requirement. Periodically maintenance (replacement of liners, placement of disinfectants/Enzymes and sanitizing) of the bins. Collection & Proper Disposal of garbage as per Standard. Placement of posters, educational material in washroom. Units can be serviced at your site as per your convenient time. Services can be done on weekly, fortnightly & monthly basis as per customer requirement.